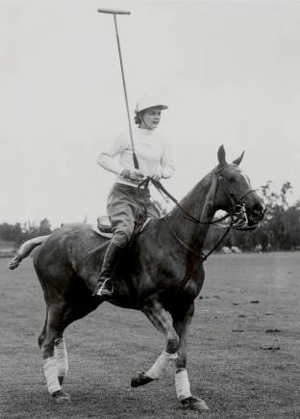 I have a special affection for extraordinary people who have been largely, and unfairly, forgotten, and one of my recent favorites is Marjorie LeBoutillier, a polo player of great ability. She first surfaces in Aiken, South Carolina, in Harry Worcester Smith’s Life and Sport in Aiken and Those Who Made It (1935), in which he wrote about, “as lovely young ladies as you ever saw, two of whom, Florence and Marjorie S. LeBoutillier, with their attractive, happy faces, engraved their girlish love of sport on my heart.” Florence excelled at tennis, and Marjorie at polo. The photo above, taken at Bostwick Field in 1935, shows her attractive, happy face, and hints at the spirit with which she played the game. In 1937, Marjorie led the Long Island Freebooters versus the hard-riding California Ramblers on fields in New Jersey and New York. In the first game, playing at back and ranked at 8 goals, Marjorie scored five goals and led the eastern team to a 7-6 victory. 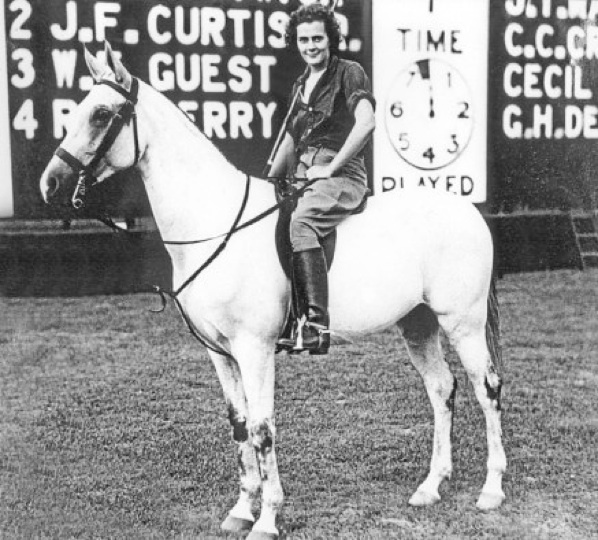 The New York Times said she was “generally recognized as the best woman player in the world,” and continued, “Hereabout it is chiefly the exploits of Miss Le Boutillier, who plays and holds her own on men’s teams and who is popularly called the Tommy Hitchcock of women’s polo, that keep the women’s game in the public eye.” At the end of the three-game East West series, it was East 3, West 0. In 1938, in what would seem a match from a fairy tale, she was wed to Stewart Iglehart, one of only three American 10-goal players at the time and a member of the Old Aiken team. They had a son, Stewart Jr., but after eight years of marriage they were divorced. Marjorie was then married to David Brown McElroy for 49 years. She was active in many sports, as one of the first women ice hockey players, a golfer with a 6-handicap, and a champion squash player. She died in 1997. A grandson, Fielding McElroy, remembers her as “an outstanding athlete and fun to be around!” Not a bad legacy at all. I am grateful to John and Fielding McElroy, son and grandson of Marjorie, for their help in this piece, and to the Polo Museum and Hall of Fame. Also: “Women in Sports” Maribel Y. Vinson, New York Times, July 11, 1937; Time, February 14, 1938, & September 30, 1946; New York Times, February 2, 1997.